Teachers Protest; Discipline Disparities Persist; Trans Students In The Classroom : NPR Ed Teachers in Oklahoma and Kentucky protested this week. A new report from a government watchdog shows persisting discipline disparities in America's classrooms. 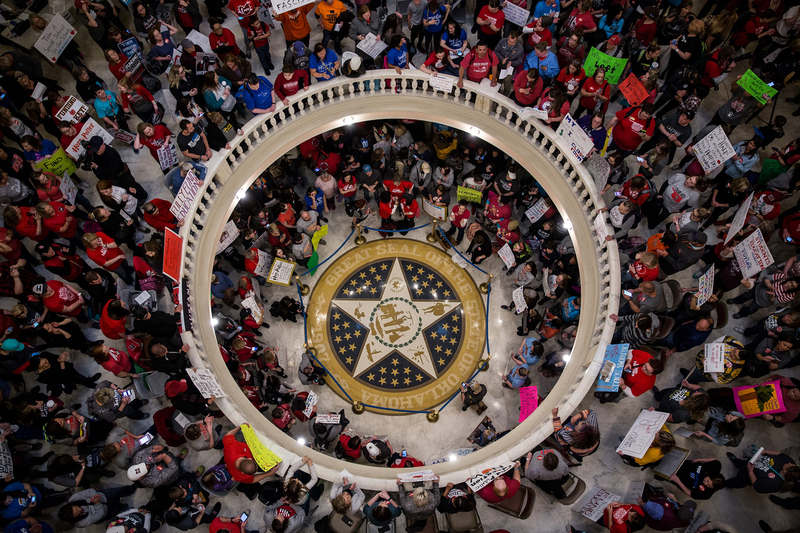 Teachers and demonstrators hold signs during a rally inside the Oklahoma State Capitol building in Oklahoma City, Okla. Hundreds of teachers gathered to press demands for additional funding for the state's public schools. "We're tired of being pushed to the side," Ashley Robertson, a fourth grade teacher in Blanchard, Oklahoma, told NPR last week. "We're tired of our kids being pushed to the side." Teachers in Kentucky also gathered at their state capitol on Monday to rally for education funding and protest proposed changes to teacher pension plans. In Oklahoma and Arizona — where talk of a possible teacher strike is brewing — movements have grown with support from grassroots teachers groups drumming up support on social media. Teachers in those states were inspired by the successful nine-day strike in West Virginia last month that ended in a 5 percent pay raise for teachers. The New York state legislature passed a law this week to require all female-designated bathrooms to carry free menstrual products, like tampons and pads. It's the third state — behind California and Illinois — to pass such a measure. "Menstrual products are as necessary as toilet paper and soap, but can be one expense too many for struggling families," tweeted New York Governor Andrew Cuomo on Monday. On Wednesday, the Government Accountability Office, a nonpartisan federal watchdog, released a report detailing differences in the ways that K-12 students are disciplined in schools across the country. They found that black students, boys, and students with disabilities receive more suspensions, expulsions, and other punishments than other students, regardless of the poverty level of their schools. "The idea that discipline disparities transcend poverty is something that is pretty important and has not been understood in that way before," says Jacqueline Nowicki, who led the team of researchers at the GAO. The report came out the same day Education Secretary Betsy DeVos held meetings with teachers and advocacy groups to discuss student discipline. She's deciding whether or not to rescind Obama-era guidelines from 2014, that said districts should be held accountable under federal civil rights laws — not only if their discipline policies reveal discriminatory intent but also if they "have an unjustified effect of discriminating against students on the basis of race." In short, intent matters but so do results. During the process of transitioning, many trans youth choose to change their names, either socially, legally, or both. A new study published in the Journal of Adolescent Health found that when people around them – like parents, teachers and peers — use these chosen names, trans youth are at a lower risk for depression and suicidal ideation. Researchers studied trans youth in three cities and asked them about places they are (or aren't) called by their preferred name, including school and work. "Results have important implications for a range of social policies," the study concluded. Legal name changes can require long, drawn-out processes, but sometimes institutions like schools and hospitals wait for these legal changes until they use chosen names. By simply calling trans students by their preferred names, teachers and classmates can offer support when students need it most.